Halftime Show | Get Off My Lawn!! “Last night was the end of an incredible journey. Although I’ll still be doing my Rap Is Outta Control show on Sirius XM, Halftime was the baby of the family that is now grown up and moving out of the house. I did all I could do there and thought it was time to officially make it part of NYC radio history. I am sad, however, that the state of radio in NYC is where it’s at. Outside of Jay Smooth I’m not sure if there are any remaining Hip Hop shows on the FM dial. The 90’s were so important to us not only for the radio shows we grew up on and the type of music being made, but for the vibe and relationships that existed between artists, stores, labels….people. It really was a feeling in the air that doesn’t exist anymore (R.I.P. Fat Beats). Sure, there’s still good music being made which I play every week on RIOC, but there’s something about the aura that just isn’t there. Much, much love to the Awesome Two, Red Alert, Marley Marl, Kevy Kev, Clark Kent, Pete Rock, Mr. Magic and a handful of others that laid the blueprint for us in the 80s. Thanks to Stretch and Bobbito for being the first ones in NYC to allow me to get on their airwaves and start making a name for myself. And thanks to DJ Riz who I started Halftime with (along with Lynn Gonzalez) who used to let me tag along with him to BAU and once in a blue moon get on the wheels and mess around. Oh what a beautiful journey. As you all may know by now, the Halftime Show is coming to an end next week. Many have been reaching out, asking if we’re taking over the slot. Well after 13 years, the time has come to say goodbye. Tonight, Feb 24, 2016, will mark the last episode of Squeeze Radio. I want to say thanks to all the artists that stopped by and showed love throughout the years. It makes me happy to have been able to provide a platform for you all. Special gratitude to @KoolBobLove and @LordSear for opening the doors via the CMFamalam radio program. To @DjEclipse for holding it down whenever I was out doing shows and for opening the @wnyu doors to us. To @Timmhotep for smashing the airwaves with me for the first five years (shout outs to Adam Waytz!). To @Lookatlen for always being there to provide advice and help when needed and to @ItsMazzi for showing up one day and never leaving (lol). To all college radio promoters, artist managers, label heads and behind the scenes folks thanks. A special, super mega shout out and love to you the listeners. Thank you for always being there, I hope you enjoyed the show as much as I (we) enjoyed doing it for you. I saw countless Friday morning sunrises, all worth it because of you. 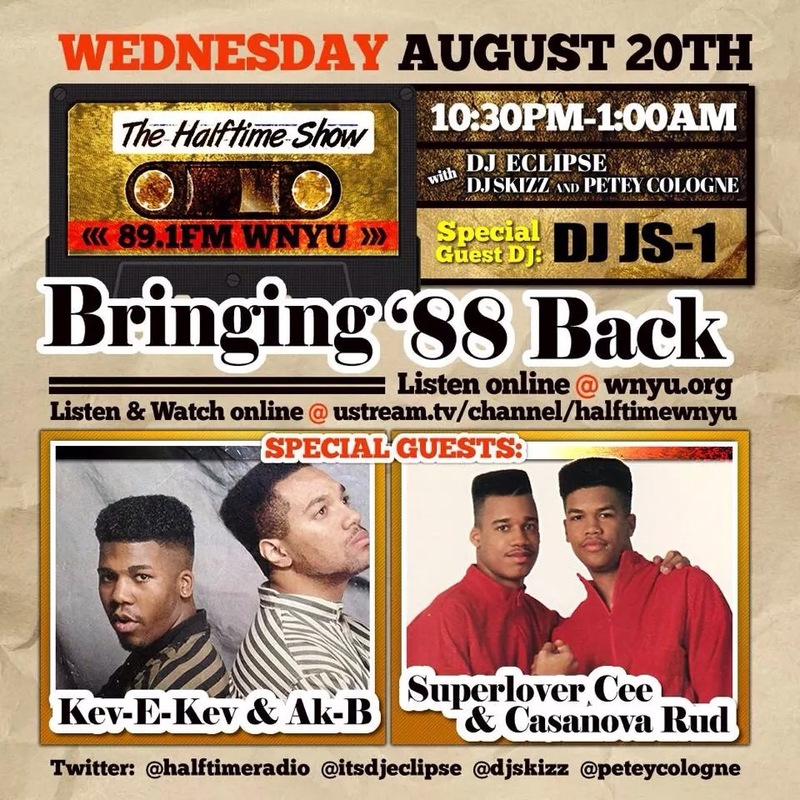 Tune in Wednesday night 10:30PM-1:00AM as DJ Eclipse and the Halftime crew bring ’88 back. Listen online at wnyu.org or stream at ustream.tv/channel/halftimewnyu.